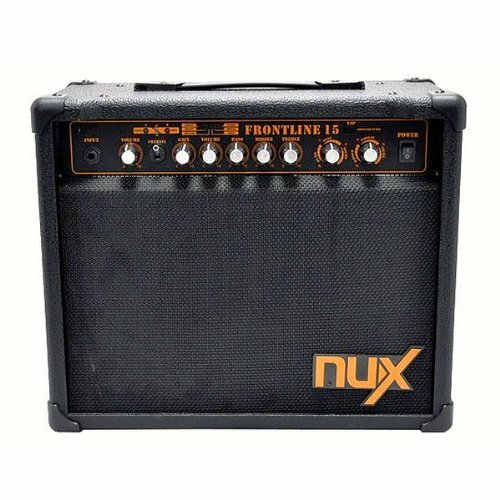 The Frontline 15 combo amp has six Pre-amp models in the distortion channel, and a Mic input with a volume control. The 15-watt Frontline combo is a stereo amplifier with an 8 inch speaker and headphones output. The analog preamp gives you that warm tube sound. The two channels, Clean and Distortion, can be switched via the foot switch jack in the back. The distortion channel has six amplifier models: BOOST, BLUES, CRUNCH, SCOOP, METAL and SOLO. Add to this 6 effects to choose from, two can be used together: CHORUS, FLANGER, ECHO, DELAY, ROOM and HALL.